Others will mistake you for a real Clone Trooper straight from Episode II with this deluxe Star Wars costume. The polyester jumpsuit features realistic rubber molded bodysuit armor pieces. Plus, the costume also includes a 3D rubber belt, matching gloves and a 2-piece ultra authentic PVC mask. 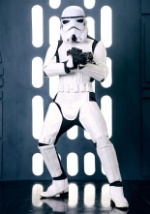 Become an elite trooper of the forming Galactic Empire with this officially licensed Star Wars costume. Add a blaster from our Star Wars accessories to exterminate what's left of the Jedi.